Apple's new operating system, OS X 10.8 Mountain Lion for Macs will be released on 25 July if the firm follows tradition. Apple released the "gold master" version of the software to developers Monday. The public will likely get the same copy of Mountain Lion, which is expected to be made available for download on July 25. The release is likely to follow this year's earnings call which is scheduled for 24 July. Apple had previously announced that the OS upgrade would launch this month with an upgrade price of $19. 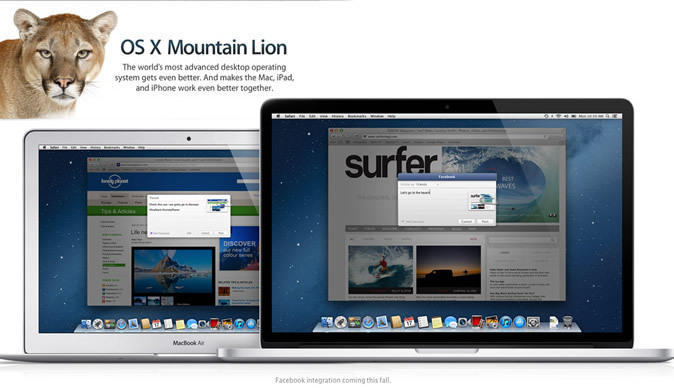 According to Apple, Mountain Lion will be even more Facebook friendly. The OS X has built-in Facebook support, you can share what's up with you right from the app you're in. Post photos or links. Add comments and locations. Just sign in once, and you're all set up. Mountain Lion adds your Facebook friends and their profile photos to Contacts so you can find them fast. When friends update their information on Facebook, it's automatically updated on your Mac. Your Facebook notifications show up in Notification Center. And you can even update your status right from there.